Here’s some health advice for the next time you feel the urge to indulge in some french fries: be careful where and how you do your deep-frying. It would be better, of course, if you avoided eating fried foods altogether. 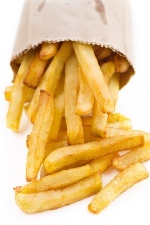 The problem is, foods like french fries and donuts are high in a dangerous fat called trans fatty acid (TFA). TFAs have been proven to be a risk factor in developing heart disease. If you can’t stay away from fried foods completely, you can find some solace in the recent findings of a study conducted at the Central Food Technological Research Institute in India. There, researchers have determined that you can lower your intake of TFAs from fried foods by choosing the right material for your deep-fryer and cooking at the right temperature. Researchers at the institute undertook a study to determine the effect of heating vegetable oils and partially hydrogenated vegetable fats with different initial TFA content in stainless steel, hindalium (an aluminum alloy), cast iron, and glass containers. Ground nut oil, refined, bleached palm oil, and two partially hydrogenated vegetable oils with low and high TFA content were uniformly heated at 175-185 degrees Celsius over a period of 12 hours. Most people don’t do deep-frying at home—and finding a place where healthy oil is used in a stainless steel deep-fryer at your favorite local restaurant may be a bit of a challenge. It should be worth the effort of looking, however, if you can lower the amount of trans fats you get in your diet.